Lighting-Gallery-net - Forlorn Fixtures - Lights in Need of Love/???? It looks sort of like some kind of floor lamp propped up like this. Around here, the utility uses electrical tape to "repair" faulty latches on lights, wrapping it around the entire body of the fitting. Sometimes, they last for years, other times, a mere few weeks. I would make that disappear there and reappear at my house. I've seen utilities here do some pretty tacky patch jobs with electrical tape before. 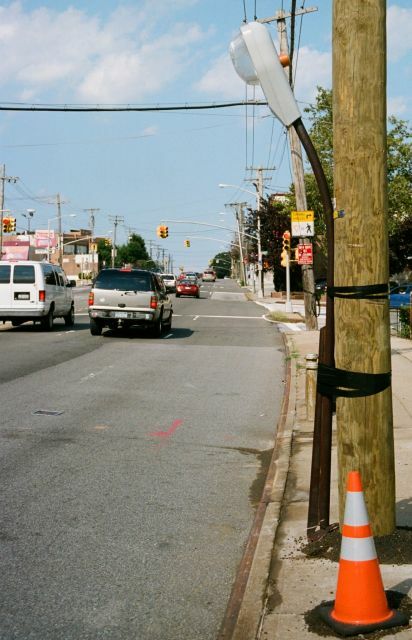 I've often seen streetlight covers with faulty latches tied on with black plastic cable ties here. Those have electronic ballasts in those new OVG which replaced the magnetic ballasts HPS fixtures....and in NYC they have done a MASS fixture replacement...so you won't have much luck having it converted to MV....NYC knows! Get a cast iron base made for that, or take some dumbbell weights and stick the post in it and you'll have a cool bedside.... oops! I said too much!